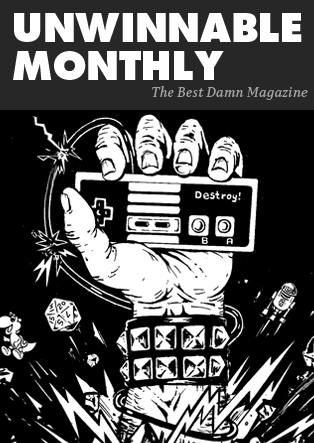 Eagle-eyed Unwinnable readers will remember that my first piece for this site was a review of Hexage’s Space Invaders tribute (with a twist), Radiant. 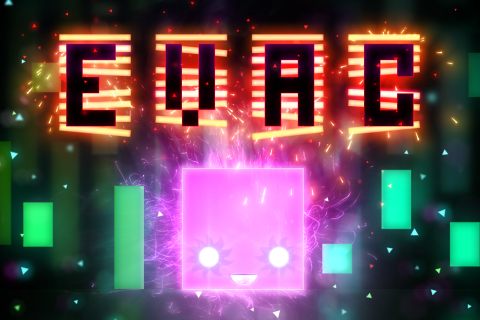 Well, Hexage is back with EVAC, a tribute to Pac-Man (also with a twist). This should not surprise you if you’ve been paying attention. On its face, there are a lot of parallels between EVAC and Pac-Man. 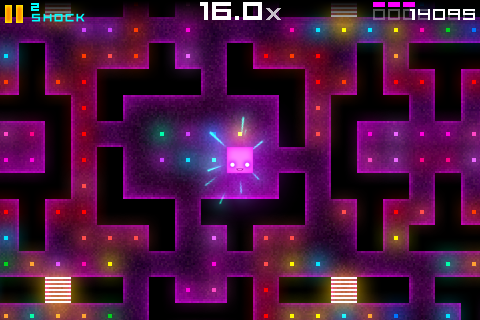 The player navigates a pink box around a maze, eats dots, avoids red box monsters and clears the maze. However, the mazes aren’t always straightforward. Hexage inserts multiple Sokoban-inspired puzzles into the mix at later levels, with the puzzles naturally getting more difficult. The game also replaces Pac-Man’s ubiquitous power pellets with an assortment of power-ups that allow the player to stun, kill or simply run through the monsters. 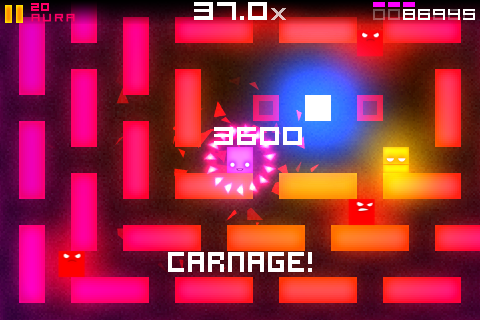 Quick play is rewarded; eating dots and destroying monsters rapidly increases the score multiplier in tenth-point increments, whereas not doing so (like, say, during the Sokoban portions of the game) lowers the multiplier. This mechanic is clearly designed to enhance the game’s replay value; once a player figures out the fastest way to clear a level, he or she will want to go back and get the higher score. Much like Radiant, Hexage inserts some character development, though so far I have yet to see much in the way of character growth in sage old box Cratos (see what they did there?) or chief villain Shadowbox. The biggest obstacle in this game isn’t always the Sokoban puzzle elements (to wit: I’ve been trying to get past the beginning of level 13 for about a day and given the lead time before this gets published, I may very well still be at that point when you read this), it’s the controls. I’ve never found touch screens to be particularly responsive, at least not for the type of precision required of video games, and I have had quite a few moments where my character has pushed a block one square too far, gotten it pinned against a wall and had to restart the level only to go through the same thing again when I did the exact same thing. It’s frustrating. Radiant’s single-axis controls mitigated those issues but unfortunately it’s the nature of the beast with a 2D game on touch-screen platforms. After a few days I got the hang of the controls and I’ve gotten better. I admit that there’s really not a lot that can be done given my chosen hardware (HTC Incredible – pretty sure iPod Touch/iPhone users will have the same issue, unfortunately). Once you get past the awkward controls, though, you’re rewarded with a challenging yet fun game, with a charming retro feel and an excellent soundtrack by Czech techno artist Kubatko. As one of those folks who values value, it’s a lot to get out of $0.99. EVAC was developed by Hexage Ltd. and is available for Android, iPhone/iPad, Palm webOS and Samsung Bada. This review is based on the Android version, available in the Android Market for £0.99, or as a lite version for free. The iOS version is $0.99!